Kent left 4AD after a year and started another Beggars-affilated label, Situation Two. Under Ivo Watts-Russell's guidance, drawing influence from other UK indie labels such as Beggars Banquet, Postcard Records and Factory, 4AD quickly established a unique identity thanks to both the cover designs of Vaughan Oliver/v23 and the label's unique numbering system. In 1992, 4AD entered a highly publicized Stateside distribution deal with Warner Bros. Records, opening offices in New York headed up by Robin Hurley. Watts-Russell moved to Los Angeles in the mid 90s resulting in the label being largely been run from California for the rest of that decade. Ivo sold 4AD in the late 90s, although his influence remained apparent for years after. In November 1999 it was announced that, following the departure of Hurley as label chief, Beggars Group's chairman Martin Mills had taken the opportunity to relocate its HQ to London and install a new label head, former Beggars head of press Chris Sharp. Sharp was joined by former Mantra Recordings A&R man Ed Horrox. Sharp was ousted from his role as MD by the Beggars Group management in April 2008. Simon Halliday, ex-Warp Records US, took over as MD. His first move was to "retire" fellow Beggars Group labels Too Pure and Beggars Banquet - key artists on the defunct imprints were transferred onto the new expanded 4AD. HAD - Used only once, for the UK reissue of Matt Johnson/The The's "Burning Blue Soul"
The letters CD appended indicate a compact disc, and the letter C appears in between the prefix and the catalog number on a cassette (ie: CAD C 809 for the cassette version of CAD 809). An appended D indicates a double or special limited release, and an R indicates a remix single/EP. For promo releases and a few other oddities, the alphabetic part is quite often an abbreviation of the band's name, and the numbers are sequential across promos by that band. * In 1980, releases were simply numbered sequentially. The AXIS numbers took up 1 through 4 (with AXIS3 being reissued as AD3), and the 4AD numbering took over with 5. * From 1981 through 1989, the numbers became three digits, with the first digit representing the year and the other two being a sequential number for the year. For example, the first release in 1981 is numbered "101", the twelfth release in 1984 is "412", etc. * From 1990 to 1999, the numbers became four digits, with the first digit again representing the year. So the first release in 1990 was "0001", the sixth in 1997 was "7006", etc. * In 2000, the first two digits of the number became "2K", with the other two digits being the usual sequential number. * From 2001 on, the first digit has been "2", the second has represented the year, and the last two have been sequential. So the first release in 2002 was "2201", the 11th in 2003 was "2311", etc. * From 2010 on, the first digit has been "3", the second has represented the year, and the least two have been sequential. So it's "3101" for the first release of 2011, and so on. See 4AD Ltd. for legal entity. 4AD had a strong impact upon me. Suffice it to say, that significal part (well, best part) of my CD collection are the label's releases. 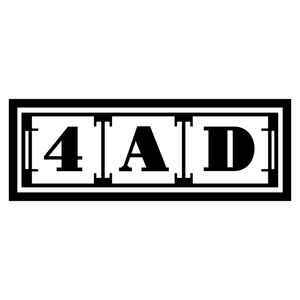 Indeed, 4AD is "the perfect antidote", as one of its fan-sites is called.